Recorded Live at Hof Ter Lo, Antwerp, Belgium - May 03, 2000. (*) include Bruce Dickinson and Nicko McBrain from Iron Maiden as special guest stars. Files: 15. :: Size: 168.43 MB. 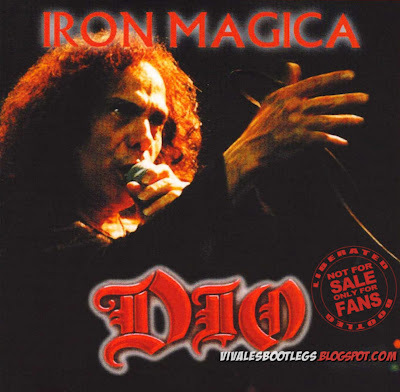 Personnel: Ronnie James Dio on vocals :: Craig Goldy on guitars :: Jimmy Bain on bass :: Simon Wright on drums :: Scott Warren on keyboards. Guest Musicians: Bruce Dickinson & Nicko McBrain from Iron Maiden. 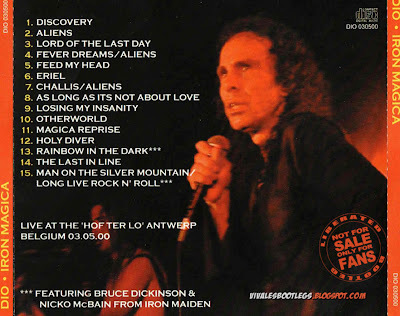 Notes: The title of the bootleg comes from the guest appearances of Nicko McBrain & Bruce Dickinson from IRON MAIDEN (at "Rainbow In The Dark" & "Long Live Rock 'n' Roll"). The recording seems to be sourced from soundboard, as no crowd noise is there. The show seems to be incomplete, though. The first part of the show is missing, if I compare to other setlists from the same tour.